This PDF 1.4 document has been generated by Writer / LibreOffice 3.5, and has been sent on pdf-archive.com on 09/05/2016 at 14:05, from IP address 223.228.x.x. The current document download page has been viewed 307 times. File size: 414 KB (14 pages). 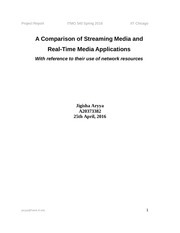 Streaming media and real-time communication over the Internet are very popular now-a-days. consumption and underlying protocols that determine their behavior. multimedia application based on these results. that there is a greater need for low latency, efficient exchange of data with the peer hosts. the test machine, the primary source of information for our analysis. variations and noted the results. The network communication process is a seamless handover of data from one layer to the next. role to play in multimedia applications. former is a one way data delivery service, while the other one is a two way communication. data that is free from latency issues and loss of data. computing device, however, is the same throughout all the experiments. hotspot and the latter a D-Link 524 model wireless router. The IP addresses are 192.168.43.85 or 192.168.0.102 (or similar). were far below what is expected from a 3G or 4G connection. Hangout experiments. Skype was tested with its Linux client. We install Wireshark for capturing the protocol traces and statistics of data exchange. packet types of this trace. network when no active network application is running. of bytes received by the device. network activity. This is a critical factor when it comes to media applications. needs to run on our test machine. The traces show that TCP, TLS, SSL and IPv4 protocols were dominant in bytes exchanged. Others were ARP, UDP and DNS. The steady state trace starts with the 3 way handshake with flags : SYN, SYN/ACK and ACK. number. UDP is an alternative to TCP that is meant for low latency loss tolerating connections. This experiment is performed on IIT, Chicago's online video lecture portal – BlackBoard. which in this case is my.iit.edu (IP address with most HTTP conversations: 216.47.143.50). This experiment confirms what has been already observed during the Youtube experiment. Skype, a highly popular application for text, audio and video communication over the Internet. in text, audio and video mode. three different situations and provide insight. UDP conversations versus 5 TCP conversations during the session that lasted for 23 seconds. most UDP packets with the same host as mentioned above (socket: 192.168.43.83:50891). TCP, which is needed for fast, efficient communication vital for real-time media. The results are similar in this case, except for the total data exchanged that was 4 times lesser. than 15 times lesser for TCP as compared to UDP as expected. In the steady state, the same host IP addresses were seen in 6 UDP and 6 TCP conversations. This file has been shared by a user of PDF Archive. Document ID: 00370101.